Terry Jones is known more for his directorial work with Monty Python than his children’s writing. Though, his collection of fairy tales written in 1981 should not be ignored. Instead of humorously remixing reveered stories like John Scieszka or Fractured Fairy Tales, Jones provides the reader with a sequel to Hans Christian Andersen’s collection. Though Andersen penned a parade of timeless classics, many of his tales are too personified and involve archaic objects modern children can’t relate too. 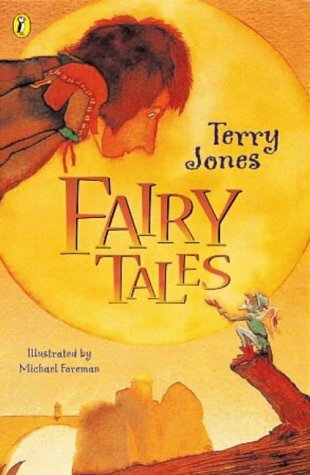 In ‘Fairy Tales,’ illustrated by Michael Foreman and published in 1993 by Puffin, the 30 tales spread over 160 pages are a light read and accesible to readers in the 21st century. For example, in ‘Three Raindrops,’ Jones elects to personify rain, and does so with a quick and comical yet devastatingly effective punch. The beauty in these tales is how they are written in the vein of classic fairy tales without heavily invoking a medieval spirit. This work shows Jones as an author still discovering his talents. While ‘Katy-Make-Sure’ is a fun open-ended spattering of words, another tale, ‘The Silly Kings’ reads as though it was written merely to supply an all-too-predictable moral lesson. Regardless, ‘Fairy Tales’ is not only a delicious appetizer for any lover of the genre, but also an inspiring short-story collection blue print for writers.